A VoicePAD is a personal access device with most of its functions ripped out. Just about all it's good for is making voice-calls and managing your contacts. The only reason to even have one is for its anonymity, which for a certain kind of person is all the reason one needs. The pros of this card should be obvious. For every credit you're not spending out of your own bank for playing cards, the more credits you have to spend on other things. The slightly less obvious pro of this card, is that it seriously ramps up the gain from burst economy cards. 3 of these turns Sure Gamble into a 7 card, A Dirty Laundry into a 5 card, a Lucky Find into a 9 card (over two clicks of course). The reason it sees so much play out of Kate "Mac" McCaffrey: Digital Tinker is that the first PPVP you install each turn is only a single credit, making the savings even better. Most events sit in the 1-3 range, too. So why not play a The Maker's Eye, Legwork, Quality Time, Test Run, or a Special Order for free? 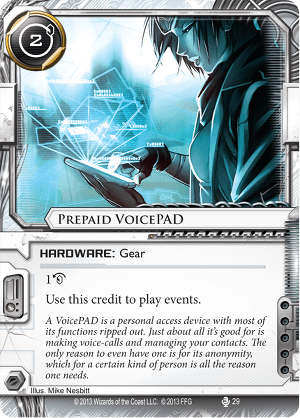 It's often said that Netrunner is a game about tempo, and having the ability to play events out of hand, regardless of finance, helps maintain that tempo, and it's the reason the Prepaid Kate deck archetype is so powerful right now. But as a neutral card with zero influence, these can fit in any event heavy deck. Ken "Express" Tenma: Disappeared Clone is also a good fit, as you can end up making cash from some of the more expensive run events like Legwork. The only hate card that immediately comes to mind for this is Student Loans which can slow the PPVP economy right up if it's not dealt with quickly.